In 1927 Hans van der Laan, member of a celebrated family of architects, abandoned his studies at the TU Delft and joined a monastery. 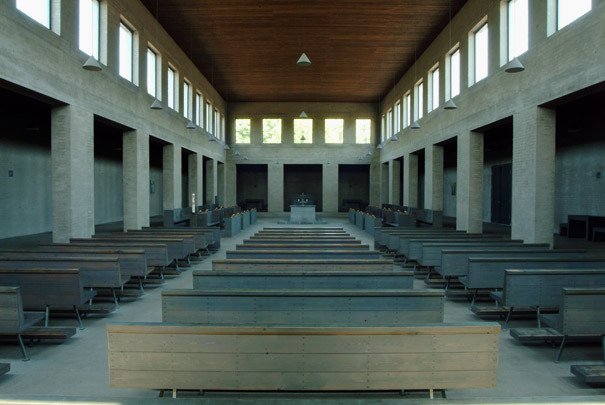 This Benedictine monk and architect spent years searching for the essence of architecture. He worked steadily on a system of measures and proportions that was eventually published (in 1960 in French and in 1967 in Dutch) in his book on the ‘plastic number’. Unlike the golden section or the Modulor proportional system derived from it by Le Corbusier, the plastic number is not flat but a three-dimensional system based on an instinctive sense of small, medium and large. Height, breadth and depth of all components - windows, columns, walls and wall planes as well as the intervening spaces - are determined by this proportional system. The so-called Bossche School took this work into the secular sphere. Over the years Van der Laan made various additions to the abbey church designed by Dominicus Böhm and built in 1923: an entrance building and porter’s lodge, a two-level atrium, a cloister, a church and the crypt below it. Building and interior radiate peace and contemplation. The atrium with the stair leading to the colonnade around the main church space and the basilica-like space itself, lit through a row of high placed windows, are of a peerless harmony and universality.